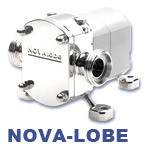 Hilge Pumps are built for performance and longevity of service in Clean-In-Place pumping applications from 0-354 GPM at temperatures up to 302°F up to 841 feet of head. 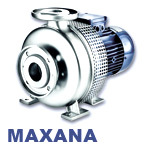 With their cold-rolled Stainless Steel casing, the HILGE HYGIANA Multistage Centrifugal Pump provides a superior smooth and clean surface when compared to other centrifugal pumps in their class. 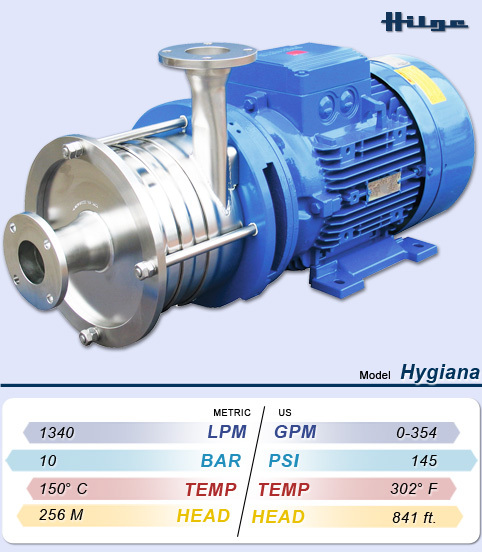 The Hilge Hygiana centrifugal pump in 316L stainless steel is a multi-stage, end suction high pressure centrifugal pump that is available in either Bloc (close-coupled), Super (stainless steel shroud and peg feet), CN (bare shaft foot mount), or Vertical configuration. 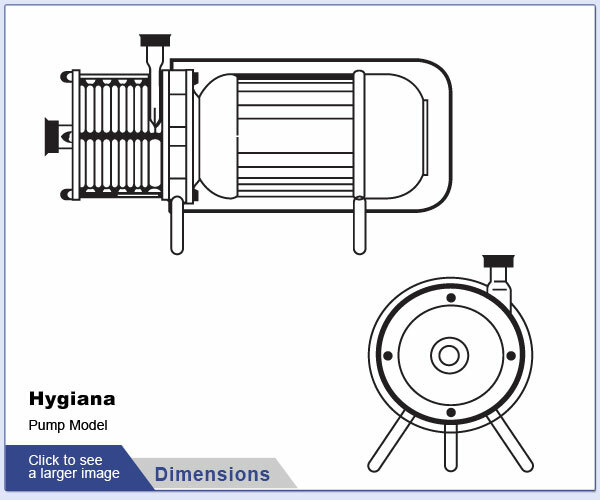 The Hygiana's impellers are shrouded and semi-open with customizable port connections that can be tailored to your specific needs. 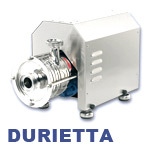 The "Sensi-Flow" design provides superior flow and handling of your product with low noise levels, making it ideal in any working conditions. 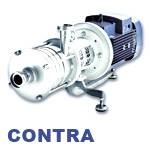 Additionally, these pumps are of an open design making them easily CIP able for your facility. 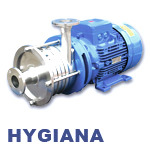 The Hygiana is available with either a single or double mechanical seal and is easily CIP able. 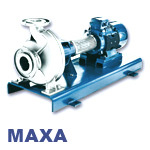 Its solid construction makes it an ideal choice for higher flow applications requiring a higher pressure such as booster pumping or filtration pumping applications. 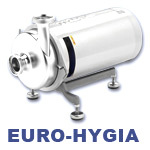 The Adapta® modular bearing housing system is available on the Hygiana II models for easy motor installations. 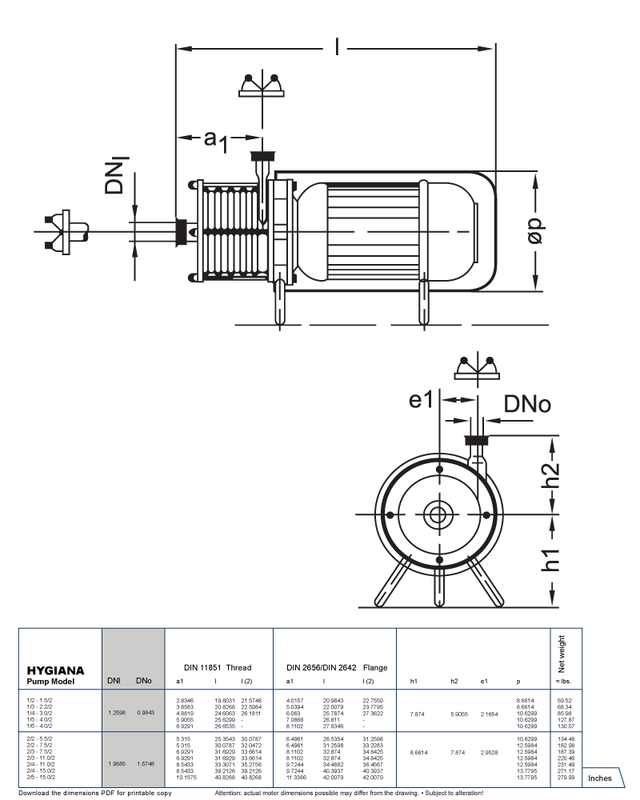 For more information about the Hilge Adapta® modular bearing housing system, please feel free to contact us at 847-439-9200 or email us. 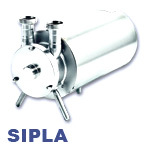 Hilge Stainless Steel Centrifugal Beverage and Sterile Liquid pumps are an ideal solution in the brewing industry or any other manufacturing where keeping your product moving with minimal exposure to agitation. For more information about their Hilge line of Stainless Steel Sanitary Pumps, please feel free to contact us at 847-439-9200 or email us. Our Factory trained engineers are waiting to help you!